The Racor 900FH series features a rugged, non-corrosive die-cast aluminum construction. The assembly has a glass bowl for use with diesel fuel only. 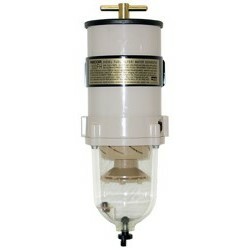 This Racor 900FH series filter assembly is an upgrade from the discontinued 900FG series. Additional accessories for the 900FH series are the Racor RK 19492 brass valve and Racor RK11-1669 vacuum gauge kit. The Racor 900FH series features a rugged, non-corrosive die-cast aluminum construction. The assembly has a glass bowl for use with diesel fuel only and comes standard in all micron ratings; 2-Micron, 10-Micron and 30-Micron. This Racor 900FH series filter assembly is an upgrade from the discontinued 900FG series. Additional accessories for the 900FH series are the Racor RK 19492 brass valve and Racor RK11-1669 vacuum gauge kit. PLEASE NOTE: THE RACOR 900FH SERIES TURBINE ASSEMBLY HAS REPLACED THE RACOR 900FG SERIES TURBINE ASSEMBLY.